Agios Nikolaos was once a small, unimportant agricultural backwater on the north coast of Crete. Today, it’s been transformed together with Elounda into one of the biggest and most well-known holiday destinations of Greece. 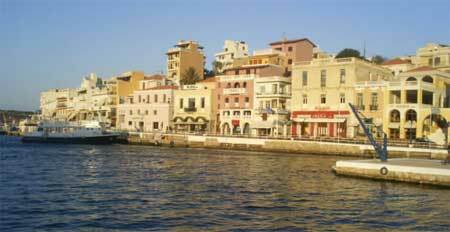 With just over 10,000 inhabitants it is also the capital of the east of Crete. 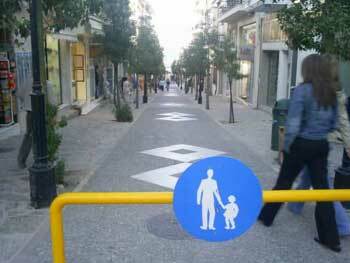 Despite the heavy tourism, Agios Nikolaos has retained its Cretan country-town charm. Historic buildings and beautiful beaches are in healthy evidence around, whilst the busy centre attracts locals and tourists alike for shopping. 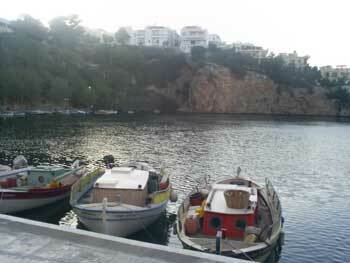 The centre of Agios Nikolaos is around a small lake, called Voulismeni. Clustered around the lake are the usual bars and restaurants. The museums are worth a visit, particularly the Archaeological Museum, which is second only to the museum in Iraklio in its importance. Particularly famous is its collection of pre-Minoan artefacts, which provide a glimpse into the life of the first settlers on Crete. The smaller Ethnological Museum has interesting artefacts from the 17th to 19th centuries, including an exceptional collection of Cretan musical instruments and machines used in the textile industry. Eating in Agios Nikolaos: You can find plenty of cheap restaurants around the main Square (Plateia Venizelou), but NOT near the lake or the port. Fast food can also be found on the main square. The De Molen is the only German restaurant on Crete that I know of. The Dutch owner advertises it as having Dutch cuisine, but it is actually German food, such as Vienna Schnitzel with chips for €7.50. There is also a very good Indonesian Nasi Goreng. De Molen can be found behind the lake, on top of the mountain. Restaurant Pelagos is set in a villa with a big garden only 50m from the port and lake, and is the best of all the top restaurants in Agios Nikolaos. As their name suggests (‘Pelagos’ is one Greek word for sea), their specialities centre around fish and seafood dishes. Unfortunately I could not find her in 2008. The place looked closed, and nobody answered the phone. So I looked for another cheap place in Agios Nikolaos. There are also at least fifty hotels in Agios Nikolaos in the mid-to upper-price range which can be booked over the internet. Ferries Agios Nikolaos: There is a ferry every other day between Agios Nikolaos and Athens. Trips from Agios Nikolaos: You can take a glass-bottomed catamaran to look at the marine waterworld, but at €16.00 (April 2017) it’s not particularly cheap for 85 minutes. There are discounts for children, and toddlers get a free ride. You can also take an interesting day trip to Spinalonga, a former leper colony from Agios Nikolaos. There are at least ten boats a day in the summer. Thanks to the price war between competing companies, these trips are quite cheap. Also there are days trips to Sissi. We recommend to visit the Amazonas Park Crete, an interesting zoo about 25 km from Agios Nikolaos near the town Neapoli.